Should you go to a clinic? Star and I have struggled a little with finding a steady connection with the bit. Star’s automatic reflex is to raise her neck and brace herself, especially if she is a bit tense or nervous, becoming quick in her gait and keeping her back hollow. Ick. Of course I would like to slow her tempo, adding cadence and push from her hindquarters, engaging her back, and getting a nice, steady connection with the bit. It’s a work in progress. 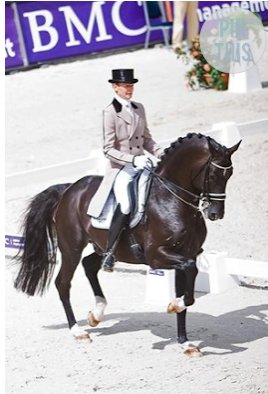 Right now I’m in the midst of a three day clinic with Corinne Dorrepaal, a wise and experienced trainer from Holland who comes to the USA for clinics occasionally. Lucky me! Clinics are expensive – each lesson usually two to four times what you normally spend on a lesson – and I found myself thinking about that cost. Is it worth it? Is he or she an effective teacher? Many clinicians offer years of experience, having seen literally thousands of horses and riders of all sorts. They draw on that vast resource of knowledge to quickly solve your riding problems. Does this person treat the students and horses with respect? A positive attitude with respect for horse and rider is nonnegotiable. They must not drive the horse into the ground with too much work during the clinic (and if you feel the work is too hard, Speak Up! ), or use their authority to abuse horse or rider. Does this clinician offer something different from my current teacher, but not conflicting with her general methods? If it’s just more of what your teacher offers (without further depth), why bother? If it conflicts with what you do at home…you will have a problem continuing the work and either lose all you gained at the clinic, or have conflict with your trainer. Don’t do it. Do I finish the lessons with practical exercises to take home and a clear understanding of what I need to do, practice, work on, aim for? Starlight in a nice uphill collected canter. She can’t maintain this very long yet, just a few strides and then we let her go bigger for a few strides, then collect again..
Is the clinician open to questions and discussion when I need more clarification? 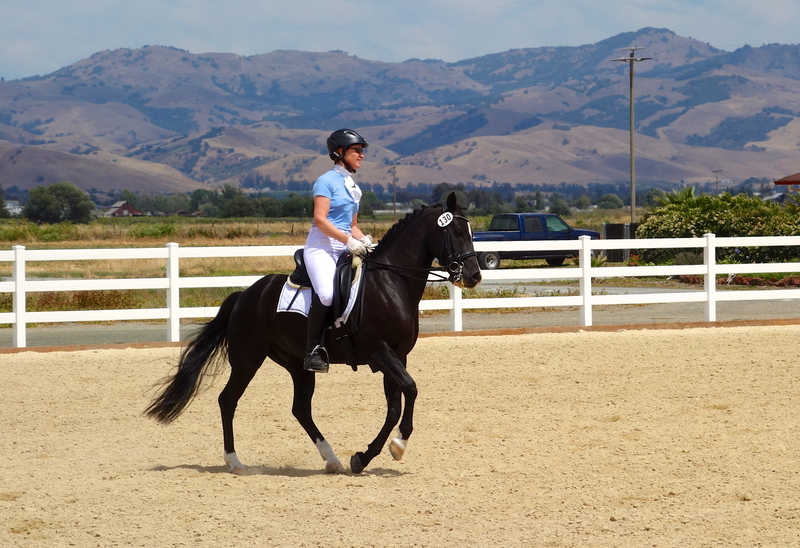 Does this clinician make a positive difference in my horse and me quickly and effectively? Day one of the Corinne Dorrepaal clinic, within 15 minutes she had my horse looking so much better! Of course, in my lessons at home, this happens too. A little warmup and some coaching does a lot of good. But I felt we made some important strides forward in the area of getting a good connection over the top. The gray areas matter: always pay attention to the little things, don’t be sloppy. Every transition, every moment. Keep asking Star to lower her neck (from the base of the neck) all the time. Be wary because she starts to bring it back up and you don’t realize it. Especially in the transitions, lower the neck, it improves them and also makes her stronger. 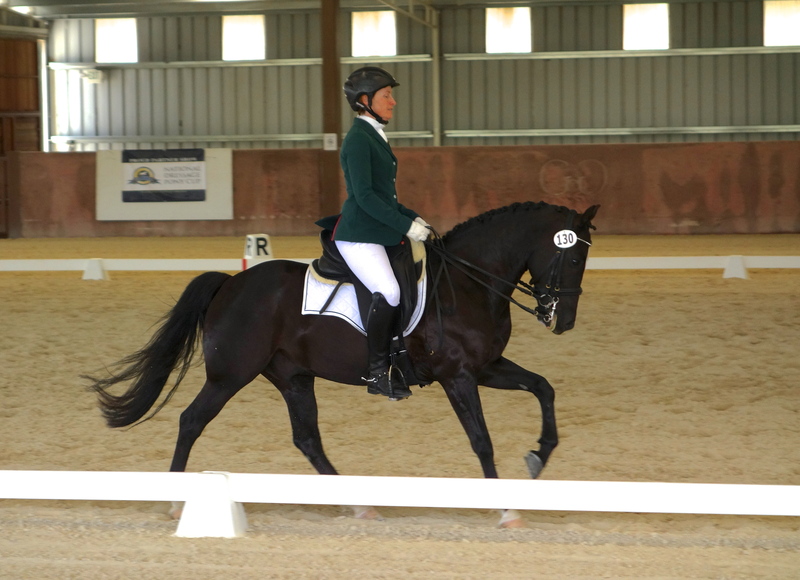 Slow the tempo down in trot and canter. Keep the energy through frequent transitions within the gait (“almost walk, trot on”), but keep the tempo fairly slow. More insights in a few days! 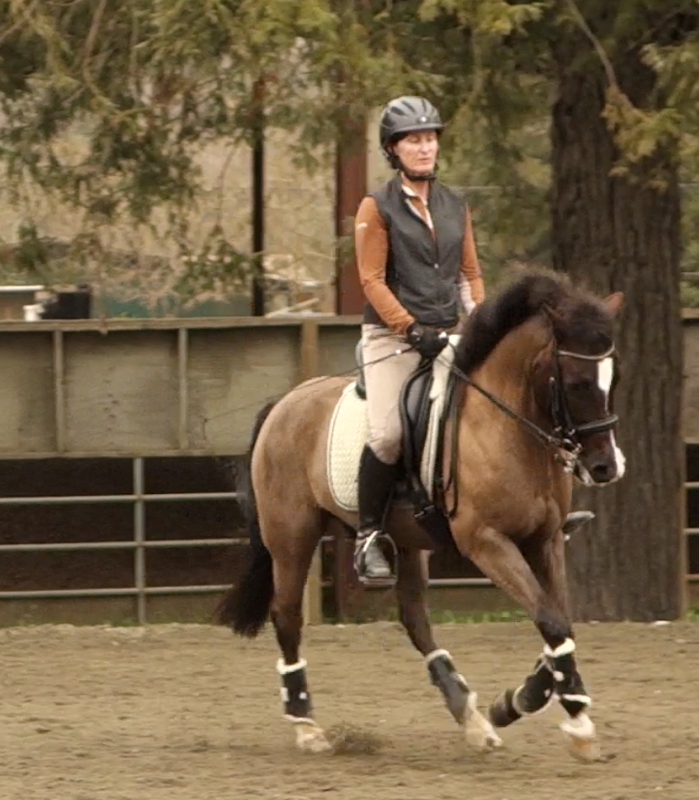 And here is a small portion of the lesson video, focusing on collecting for a few strides, then lengthening for a few strides exercise, all while keeping the neck low to engage the back. We begin with a little walk work and proceed to trot. It was a cold and breezy day, and young Starlight was full of Vigor and Vim! She was at her first dressage clinic at a brand new place, and WOW WAS IT EXCITING!!! Her mind could not take it all in fast enough, and she trotted around tensely, resisting the bend and chomping on the bit. Soon, the instructor suggested we try a canter. With some trepidation, because I could feel how high she was, I gave the aid. You can’t hear my squeak of dismay, but you can imagine it…Fortunately, my kite soon came down to earth and stayed there. From flying, Star decided that instead of cantering she would be a Pogo Stick. Bounce, Bounce, Bounce, around the circle we went, with me laughing nervously. It was kind of funny, but not terribly useful in a dressage lesson. Ah well, we got through it, and after a few minutes she settled. The instructor, Major Miguel Tavora, took us through a series of exercises designed to relax and supple the horse. Things such as trot/a few steps of walk/trot on; shoulder in on the circle; small circles at the walk focusing on getting a soft bend from the horse, and more made a big difference in how Starlight carried herself. And look what we ended up with: a beautiful dance with a supple and obedient horse. Some days it feels like I am banging my head against an immovable brick wall of lack of progress in my riding. But continuing to do the same thing while expecting different results is foolish, fruitless, or just plain nuts. Something’s gotta give. Sometimes just hitting pause for a moment and letting my horse walk around on a loose rein while I ponder the mysteries of training gives me enough mental space to figure out the problem and solve it. How about if I try it this way? (Nope). This way? (Ugg). How about this? Yes! Often I can solve things myself based on experience, past lessons and study (reading/watching videos), but when I need more help, I ask for it. Giving myself (and my horse) the freedom to experiment and sometimes look awkward, silly, or unbalanced is essential to learning. If we do not try and sometimes fail, if we worry too much about always getting it right, we are still automatons who growth and joy are stifled. I’ve been in both camps: despising myself as the worst rider of all time, hopeless, just give it up and find some other way to spend my money (and imagine how much money I’d have if I gave it up! ), or thinking, o.k., I’ll work harder and smarter and we’ll get there! Many riders divide themselves into the talented or the not-talented category, which is a FALSE DICHOTOMY. They think you’re either born with it, or you’re not. Not so: riding is not inborn, it is taught. Edward Gal and Totilas. Not many riders have his physique (look at those long, draped legs). And not many horses are Totilas, either. Well, we can’t all be at the top of the bell shaped curve. Now it is true that some people have more advantages for riding than others: long legs, shorter torso, slim elegant body, blah, blah, blah. And of course learning to ride as a child is an advantage. But everyone improves by applying themselves body, mind and soul to this impossibly engrossing task – rather, passion! – of moving in harmony with your horse. And no one gets there without hard work. Even the greats of the horse world worked very hard to get there and to keep themselves there. As long as we are happy together…that’s really the point, isn’t it? Oh well, yes, I’d like to make progress, too…and we are! Because Finn and I work hard at it. And off we go into fantasies of ourselves floating around the ring on this gorgeous horse, doing everything effortlessly. Of course, the rider on top has (usually) earned this horse. She’s in shape, she knows what she’s doing, and although she makes it look easy, guess what? It’s not. 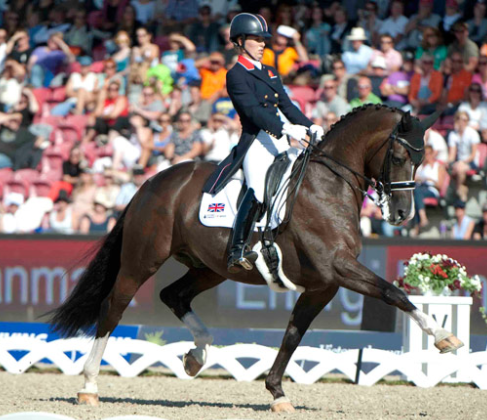 Sitting that big, expressive trot with ease and flair? Ha! Most of us would bounce right off. Going from extended canter to collected canter with invisible aids and then into a canter pirouette, all while remaining in beautiful balance, no tugging, no grimacing or grunting, no leaning forward/backwards/sidewards? Brava, rider! I’m impressed. I know how hard this stuff is, because I’m just beginning to learn it. While it certainly is very true that some horses are much easier to ride than others (no kidding! 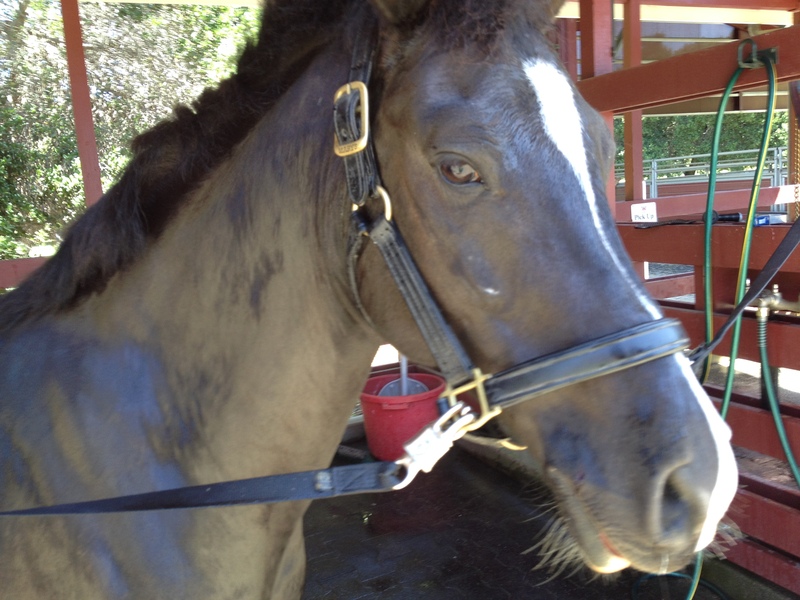 ), all horses require an educated rider to bring out their best. In our second year together, I have finally caught up to Far Above Par (“Finn) and we showed Fourth Level earlier this season. In a few weeks, we’re going to take a step of faith and go for Prix St. Georges, something new for both of us! Plus a new and updated Freestyle. Yes, yes, two new things at a show (stress meter edging toward red now). I’m crazy, but as my husband tells me, I’m never happy unless I’m pushing myself. Meanwhile, I appreciate deeply the opportunity I have to learn from my patient, humorous, educated schoolmaster pony. We’re growing together and having fun! If it’s not fun, why are we doing this? If you’re not having fun: change the equation. 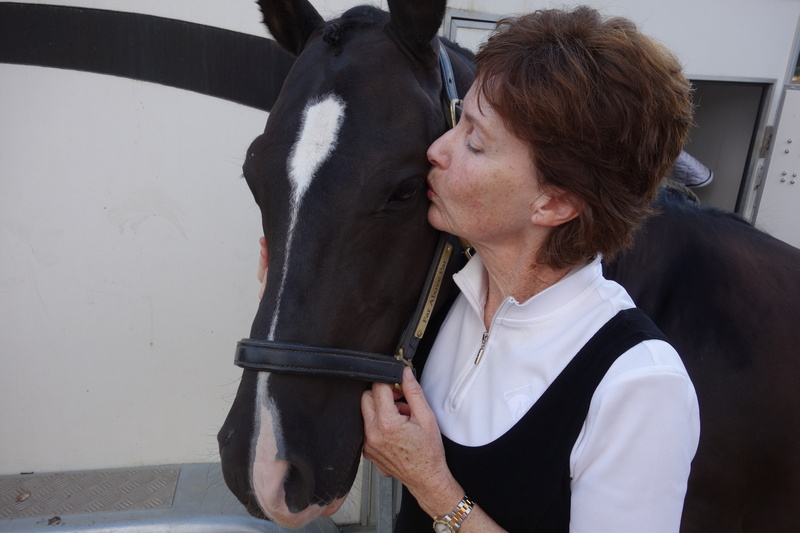 With a sense of the clock ticking for both me and Finn (“Far Above Par”) – Finn being in his prime work years, and me being, uh, not so prime but still able to work sort of hard – we’ve been signing up for clinics and applying ourselves hard to the study of dressage. That is, I have been applying myself hard: reading articles, watching videos, attending the World Cup, taking lessons. Finn goes along for the ride and will work for treats, bless his pony heart. I worked hard, I’ve had my bath. Now feed me. I can’t believe how slow and ineffectual my mom is about finishing her chores and getting to the important part of the day: MY LUNCH! How a pony suffers for his art. Finn continues to be an excellent schoolmaster, performing beautifully when asked approximately correctly (ha! ), very safe and sane. A little occasional sluggishness is excusable as the price I pay for such safety and general good nature about putting up with my learning curve. 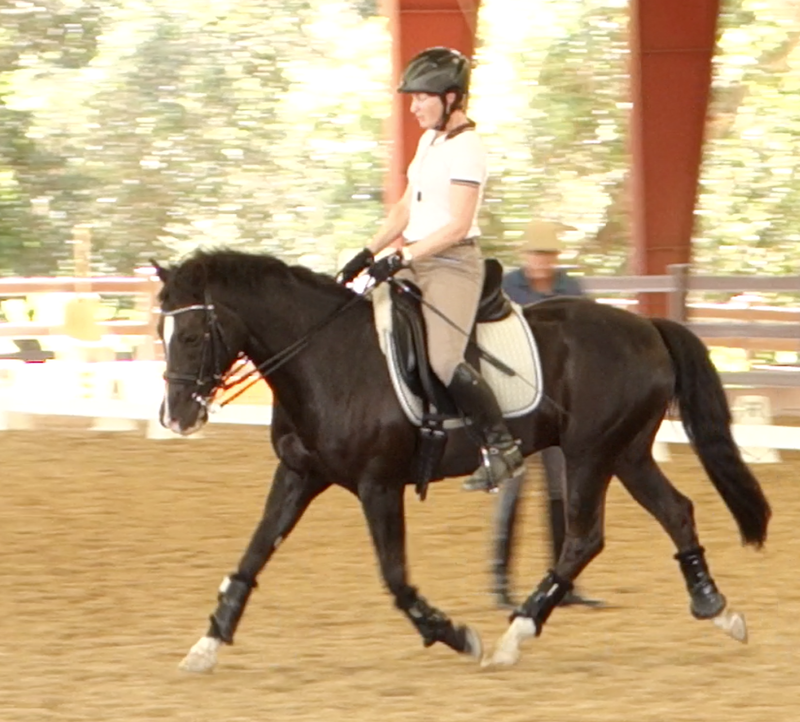 Finn and me working with Miguel Tavora – this looks like medium trot on a circle, I think. We did a lot of shoulder-in to medium trot that day. Maintaining balance all the time – through the extensions, transitions, corners, etc. If I could do everything in that list, 4th level test 3 would become simple and I could just move on to Prix St Georges, right? RIGHT? But we’re not there yet, no, not by a long shot…So, how to get from here (inconsistent) to there (balanced and consistent)? Look at me nagging! See that leg curled up with the spur pressing in? Disengages my seat, tightens my leg, and dulls his side. Not to mention my reins are too long and my hands too low, my eyes looking downward rather than ahead. I think I am posting here and that’s why I don’t seem to quite be sitting in the saddle. The details matter. Where my leg hangs (closer to the girth vs too far back), how I use it and take it off. What kind of spurs I use. 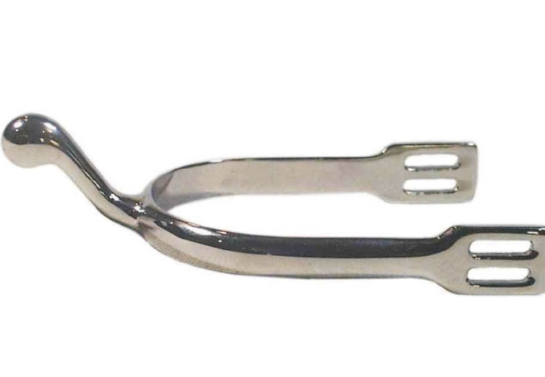 At my latest clinic, Miguel Tavora told me to get swan necked spurs instead of the Prince of Wales ones I currently use, because Finn is small and my leg is long. This will help me keep my leg long and off him rather than being tempted to have it curled up and pressed into him (as above). 2) Keep your leg long and draped! Don’t grip. Open your hips. Sit soft and deep in the saddle. Do you know how difficult this is? Yes, I’ll bet you do. Especially on a pony. It actually IS harder on a pony. O.k., enough whining. I love my pony. I can and WILL do this. Let me recommend you start with a saddle that fits you (and your horse) well. This is impossible to do in an ill-fitting saddle. My saddle fits and I have no excuse. Look at Charlotte – leg long and draped, hands forward and yet maintaining the contact. A teensy bit behind the vertical with her torso if we’re going to be nit-picky, but if anyone ever got such a nice picture of me, I’d blow it up into poster size and put it on my wall to say, “Look, I did it right for one brief shining moment!” She’s a lovely and effective rider. When I practice with Finn these days, I have mantras running through my head: reins shorter and higher! Leg long! Don’t nag! Give him space, don’t hold with your hand (but don’t let him off the contact). “Remember to reward often,” Finn says. We horses appreciate it. All this and keep the horse and yourself in balance. Oh yeah, and memorize a couple of tests, too. 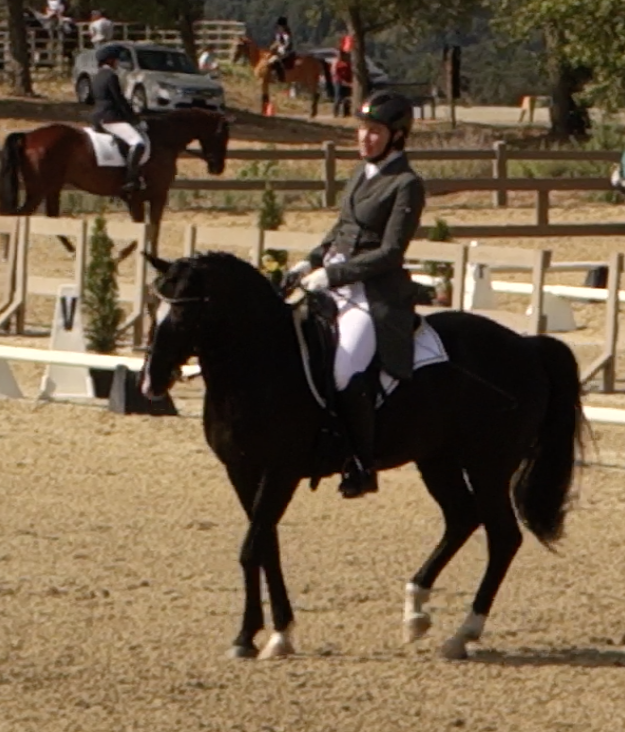 Dressage is for crazy people, don’t you agree? Finn practicing counter canter. 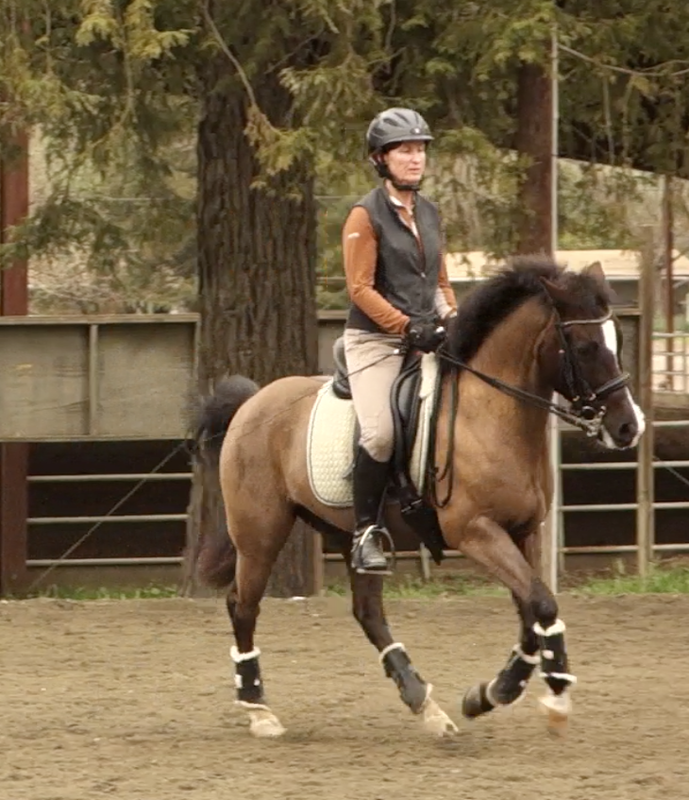 My position is less than ideal with my heel up and my hands a bit braced and flat, but note that because we are in counter canter (left lead), so my right leg is maintaining the bend by being behind the girth, and Finn has a slight bend to the outside of our 20 meter circle. 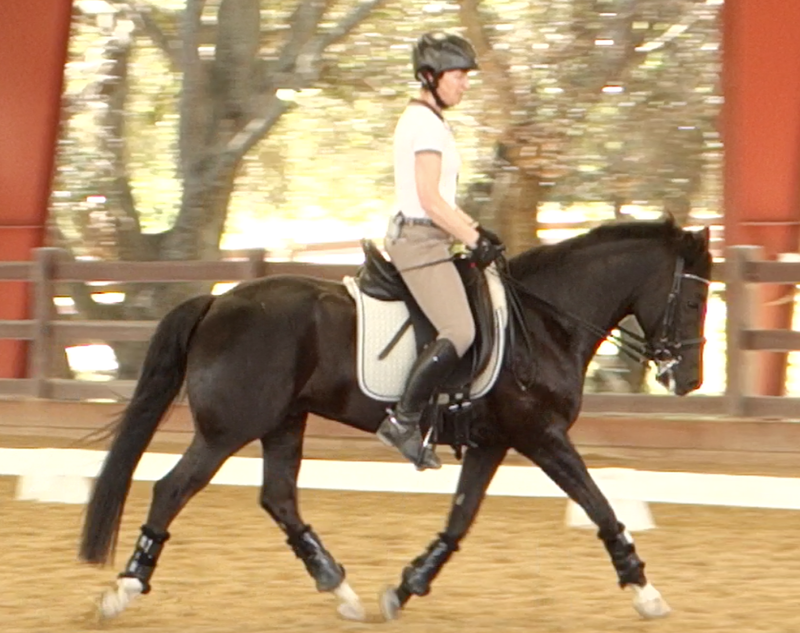 Who would have thought that counter canter would turn out to be my favorite exercise? A month ago I was struggling with counter canter. Finn and I are beginning to show Fourth Level dressage this year, but…4th level test 3 has 10 meter counter canter half circles which were our undoing. The rest of the test – not too bad – the counter canter exercise: hopeless. Which is ridiculous. Finn is small, well-balanced, athletic, strong, and trained. 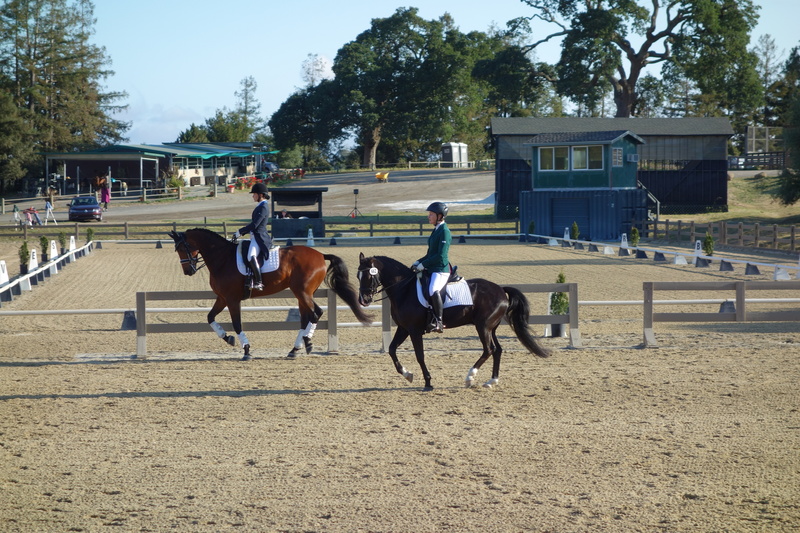 There was no reason we should be struggling so much with 10 m counter canter circles. Nonetheless, we just couldn’t get it. Smart girl that I am, I asked for help. I had a clinic scheduled with eventer Matt Brown (http://www.eastwesttrainingstables.net), and in about one minute, Matt had identified the problem: ME. Oh big surprise. I was working way too hard (as usual) trying to hold Finn in position and on the counter lead, since Finn’s usual evasion is to do a flying change onto the other lead. I felt I had to manhandle him onto that counter lead and carry him around the circle lest he change out of the lead. Wasn’t working well. We both were tense and stiff and it wasn’t pretty. 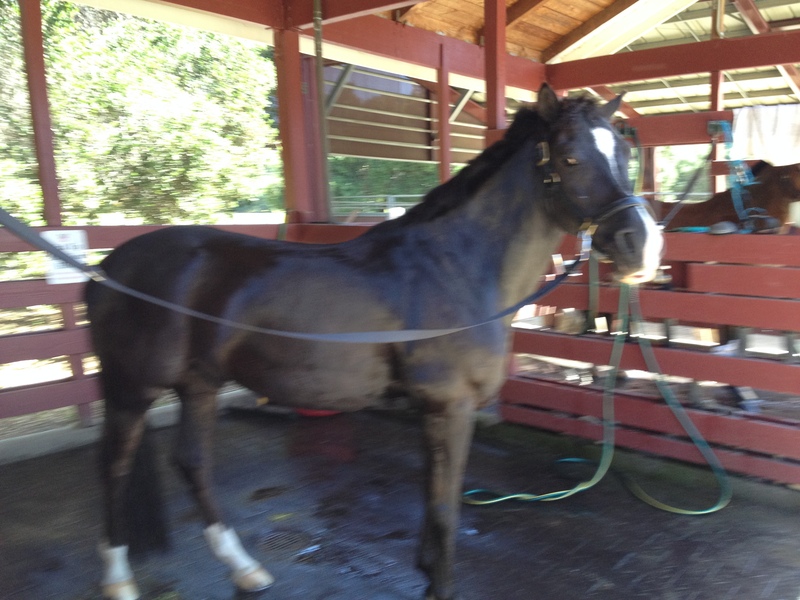 Matt had me pick up the counter canter on a 20 meter circle, and just relax, relax, relax. Relax my seat, my leg, my hands. Finn changed leads. O.k., walk, pick up the counter lead again. Now relax. Six strides later, Finn changed leads. O.k., walk, pick up the outside lead again. Relax, and canter. Within about a minute, Finn realized that he was going to have to stay on that outside lead or keep picking it up from the walk (gee, that’s a lot of work! ), but that counter canter wasn’t going to be hard, I wasn’t going to push him, we were just going to softly canter around together. Amazingly, he began to balance on his own (you mean, I didn’t have to carry him? Nope). Sometimes he switched leads, sometimes he broke to the trot. I just picked up the outside lead again, from the walk, very calmly and in a relaxed manner. I had to let him figure out the balance and make his own mistakes, rather than trying to fix it all for him and muscle him through it. We began the counter canter all strung out and on the forehand. We ended nicely balanced and jumping off the hindquarters, able to canter a smaller circle with balance. Hallelujah! 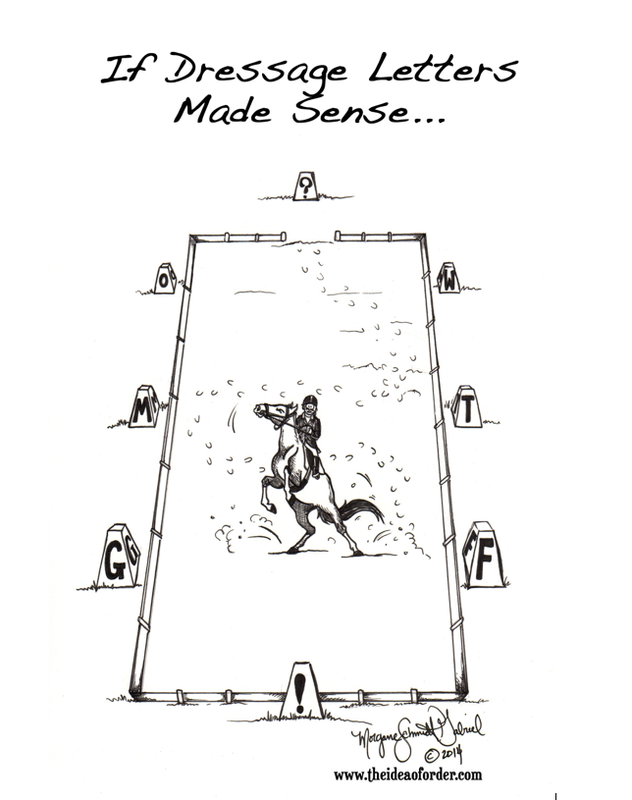 See how the “jump” improves with the counter canter? We’re still working on it, but what a difference. The counter counter improves the regular canter, too! I find if I do counter canter early in our work session, the rest of the canter work is better balanced, less strung out, and has more jump. It’s as though the counter canter on a circle fixes everything for me without me having to do any pushing or pulling (which I shouldn’t be doing anyway). I just guide him onto the circle and sit in a relaxed, following seat, keeping the impulsion and roundness, but not doing a whole lot more. I aim for the feeling that Finn is doing pushups with his hindquarters. That’s the strength building exercise I want. Recognize that this does take strength and don’t overdo it at first. Give frequent walk breaks and build up to it slowly, as you would any new exercise. Struggling a little with balance here, but look at how he is coming under himself. Doing pushups with those hindquarters.